On construction sites, it’s mandatory for workers to wear hard hats. These pieces of safety equipment protect the head from outside forces. But some people on those job sites are also dealing with forces inside their heads, forces that hard hats offer no protection against. 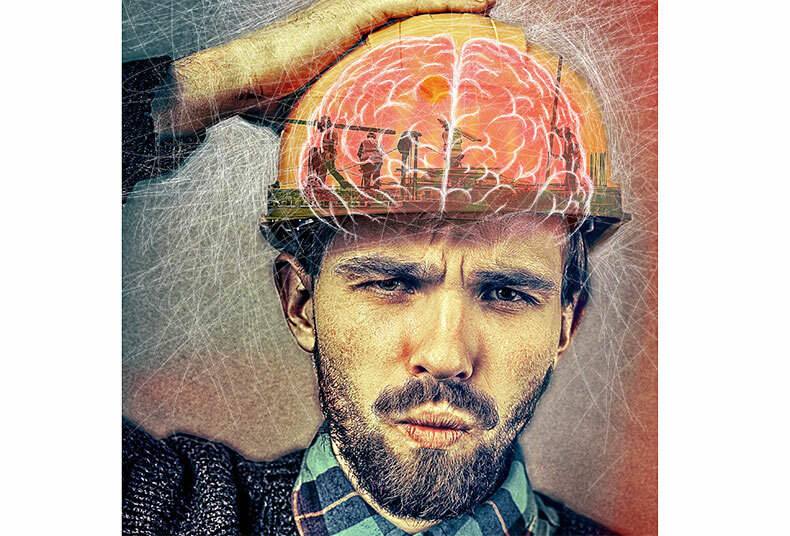 Mental health is an important component of a person’s overall health, but in the construction industry, it can be overlooked. But employers and experts are working hard to change that and open up a dialogue from which everyone will benefit. “[Talking about mental health on job sites] is extremely important. Creating a psychologically healthy and safe workplace instills the importance of the mental health and wellbeing of all employees, while supporting those with mental illness,” says Perry Ruehlen, executive director of the Canadian Society of Safety Engineering. David Grauwiler, executive director of the Canadian Mental Health Association – Alberta Division, says that work sites are like a “second home” for employees, so the need to talk about mental health has moved front and centre. “Certainly [it is important] from a bottom line perspective … We know that time away from work costs employers money. And currently in Canada, the number one reason people are missing work is not physical injury, but mental distress,” he says. Grauwiler acknowledges initiatives like Bell Let’s Talk Day, which was held on January 25 this year, have opened up conversations about mental health, but stigmas can be difficult to break down on an individual level. Addressing mental health is an important component of North American Occupational Safety and Health (NAOSH) Week, coming up from May 7 to 13, 2017. The event is a partnership between occupational health and safety organizations in Canada, the United States and Mexico. Dr. Samra has presented at CSSE conferences in the past (the organization’s next professional development conference is scheduled for this September in Halifax), and she has lent her psychological expertise in the Globe and Mail and on The Bachelorette Canada. She says that, because construction sites have so many physical dangers, that makes mental health so much more important. “If you’re exposed to certain risks, if your colleagues and co-workers are exposed to certain risks, there is an elevated level of potential stress that can add,” she says. But with so many tools in place to promote physical health, both Dr. Samra and Grauwiler agree those resources could be used to frame mental health in a way workers already understand. Heading into the future, Dr. Samra would love to see more programs and resources developed to make talking about mental health issues easier. “I think every workplace needs to be incorporating discussion of psychological health and wellness the same way we do physical health and wellness,” she says. “It’s about getting those two worlds linked together: the people who want to do the right thing and the people who can help them do it,” Grauwiler adds. For more information on NAOSH Week, visit naosh.ca.